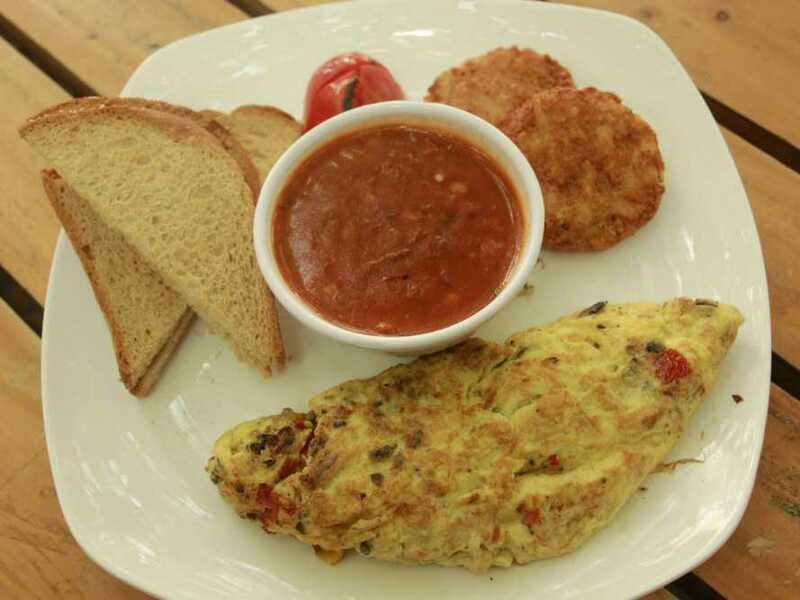 Hidden in the labyrinthine lanes of Old Delhi are some of the best food spots of the city. They are high on history, taste and atmosphere. The mere mention of Old Delhi conjures up vivid images of a crowded bazaar (traditional market), old buildings from the Mughal era and wonderful, aromatic food. Take away even one of these elements and the Old Delhi picture will not be complete. For me, Delhi is home because one half of my family lives there. So, while I live in Bangalore, I definitely end up making a ‘family pilgrimage’ to Delhi at least once a year. During my trip in October 2016, I took time off to explore the streets of Old Delhi. I was especially interested in the decades-old eateries that have been Old Delhi’s pride. In fact, many of them were set up in the early 1900s, making them nearly a century old. Some others are about a hundred and fifty years old and counting. With so many years behind them, you are talking serious history. Each of these joints has secret family recipes that have been handed down from generation to generation. Every one of them also has one or two signature dishes that they claim will beat competitors hollow. Facts like these add to the allure of these eateries. No wonder then, that they accumulated a large number of loyalists much before social media popularized the concepts of fan base and followers. Make no mistake, given the character of Old Delhi, these eateries are all dives. Nothing fancy when it comes to ambience here. People throng them only for the taste of their food, their history and the ‘atmosphere’. Without much further ado therefore, let’s attend to business, shall we? We got off the metro at Chandi Chowk and exited the station through a narrow gully (lane) that leads deeper into the Chandi Chowk market. A couple of minutes later, we spot a Hanuman temple and right opposite that, under the shade of a large tree, is Nathu Ram’s food stall. The ‘stall’ is actually a large tarpaulin sheet that has been spread under the branches of the tree. Cooks are at work under the canopy, one frying jalebis, another frying kachoris. A couple of attendants are helping the cooks out. 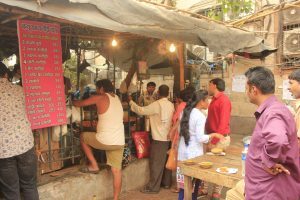 A few rickety wooden tables stand desultorily, with customers gorging from small, stitched-leaf bowls known as donney in Hindi. Nathu Ram has been feeding hungry souls for more than seven decades. Nobody (including the guy at the counter) seems to know exactly when it was set up. Frankly, nobody bothers. What they do bother about though, is the food that is being doled out. 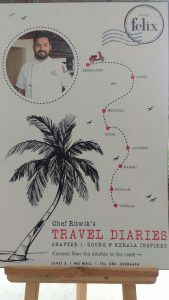 While the menu nailed to a wooden pillar announces a dozen dishes, most customers ask for one thing first: bedmi puris. We do the same. A couple of minutes later, we are handed out donnays with piping hot, crisp puris, accompanied by aloo subzi (potato curry). Bedmi puris are palm-sized fluffy breads made from whole wheat flour (atta). The dough has been infused with spicy lentils and asafoetida (known in Hindi as ‘heeng’). The aloo subzi has small pieces of potato in a spicy, watery gravy. 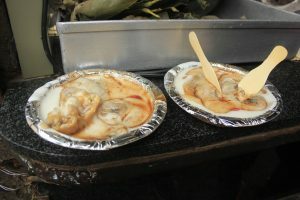 I have had this subzi at various places in North India, but the variant found in Old Delhi has a unique taste and flavor. Given the size of the puris, we nail several before drawing a deep breath and taking a break. We are sweating profusely, partly because of the heat, but also because of the spice in the food. Talk of being in sweaty heaven(exclamation). A pair of puris with unlimited refills of aloo subzi comes for Rs. 24/-. If that isn’t cheap, what is? Next, we wend our way to Gali Parathewali (Hindi for ‘paratha lane’; making it amply clear as to what life here is all about), which lies a short distance away. On the way, we pass Shishganj Sahib, a famous gurudwara. The history of Gali Parathewali goes back nearly two centuries to the mid-nineteenth century. Though the character and complexion of this street has changed considerably over the decades, a handful of the old eateries remain. They are each run by the sixth or seventh generation of Brahmin families from Uttar Pradesh (especially, the Allahabad belt), a fact they take great pride in. It is to one of these that we head this morning. ‘Kanhaiyalal Durga Prasad Dixit’ announced a large board at the entrance to the humble eatery. The fact that it was set up in 1875 is mentioned prominently. The insides of the eatery have been jazzed up a little with lights that are too bright. The cook is at work near the entrance, making – what else – parathas. You can play safe by asking for the regular aloo, gobhi, methi and mooli parathas. Or, you could get adventurous by ordering one of the more intriguing variants: nimbu, gajar, mutter, papad, kela, karela, tamatar and mewa. Our gastric juices start flowing again (never mind that we have just stuffed ourselves with puris). We seat ourselves and order three plates of parathas, which arrive a few minutes later. 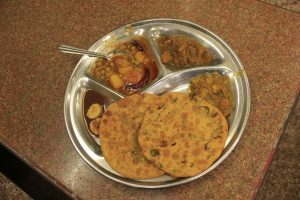 Each plate comprises two small parathas, accompanied by three curries and some pickled vegetables. Everything on the plate is delicious. We polish the food off in no time, before ordering a few more plates. 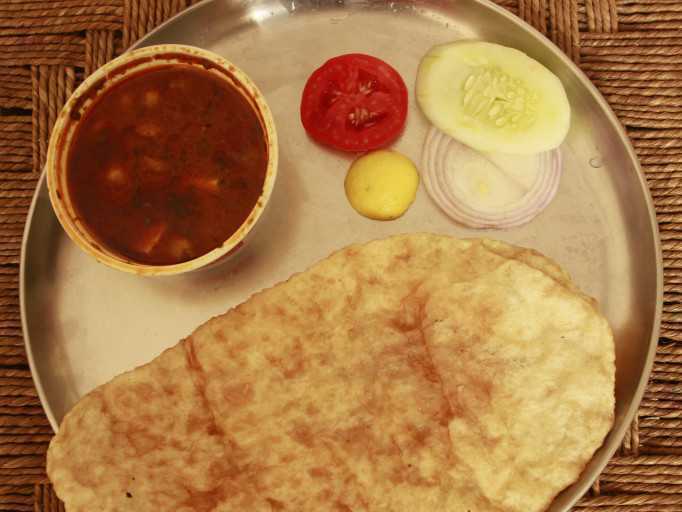 The parathas are crisp and stuffed well with the vegetables of your choice. A plate of parathas sets you back by about Rs. 60 or 70, depending upon the variant you choose. The price is steep, but worth it, considering the wonderful taste and the fact that you get repeats of the accompanying curries and pickle. Parathewali gali is somewhat overrated, but still worth a visit once in many months. Deciding that our tummies needed a respite after that overload of puris and parathas, we walk a few paces from Kanhaiyalal to Panditji’s hole-in-the-wall that serves luscious rabdi and lassi (to be explained). 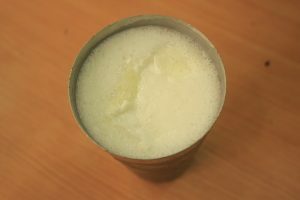 The lassi (thick, sweetened, churned curd) comes in a tall, stout steel tumbler, while the rabdi (thickened, sweet milk topped with a thick layer of cream) is served in a small bowl made (oddly) of aluminium foil. 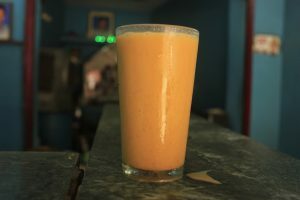 While lassi is available in most parts of India these days, you must have it in North India, especially in Punjab or Old Delhi, to savour it in its full, authentic glory. It is refrigerated and served chilled. The drops of moisture on the outside of the steel tumbler could well we a reflection of your thirst. Our thirst slaked and the fire in our tummy doused for the moment, we took a stroll through the Chandni Chowk market with its small, old shops and pavement hawkers. Cycle rickshaws and autos deftly wove through the congested thoroughfare like only they can. About an hour later, we were ready for our next gastronomical foray. And that’s how we landed up at Kanwarji’s Restaurant. You can’t go to Old Delhi and return without having had the chholey bhaturey. 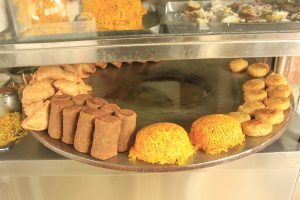 Kanwarji’s Restaurant is a narrow outlet, with sweets arranged in shelves right at the entrance. You can take one of the few seats laid out inside or opt to stand on the pavement and enjoy your food. We choose to do the former. 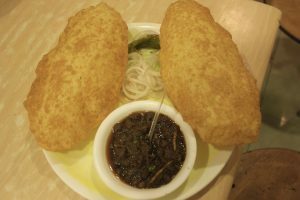 Chholey bhaturey are as much a part of Delhi’s culture as the Red Fort and India Gate. If you ask me to single out one dish you should have on your next trip to Delhi, I would recommend this dish without batting an eyelid. 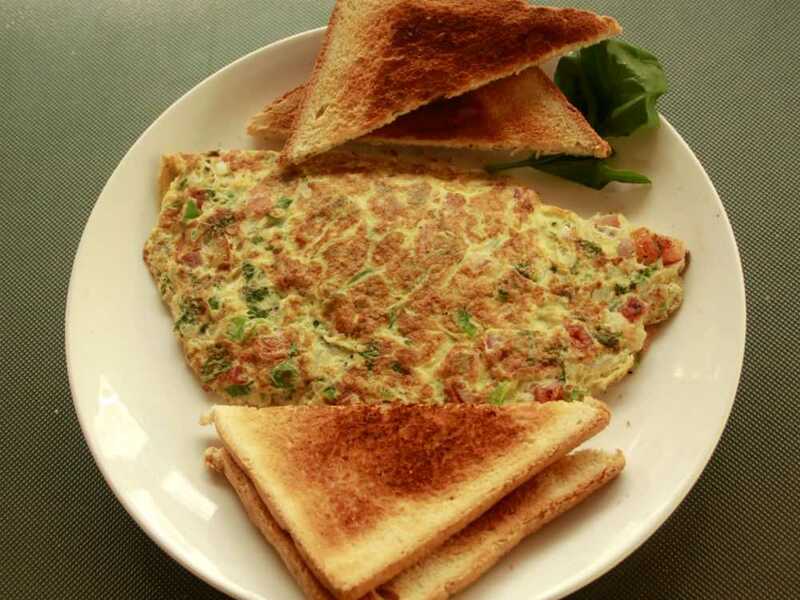 Every area of Delhi has several joints serving this staple, and each has its own taste and flavor. As if to demonstrate this point, the bhaturey at Kanwarji’s are oval (you get them round everywhere else). The dough of the bhaturey is infused with a mild mixture of asafetida and something else that I could not quite place. 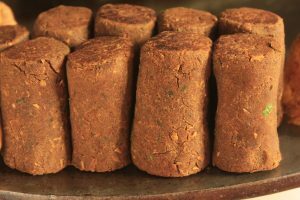 The chholey is a dark brown slurry, with chickpeas (channa) floating in it. Onion rings and pickled long green chillies (which are staple accompaniments to dishes in Delhi) complete the ensemble. I am recalling all these details for you in retrospect now. At that time though, we just waded into the food. The next time we looked up was fifteen minutes later, after we had picked our plates clean. After that, all we could do for the next few minutes was sit back and sigh in deep contentment. A plate of chholey bhaturey here comes for Rs. 60/-. 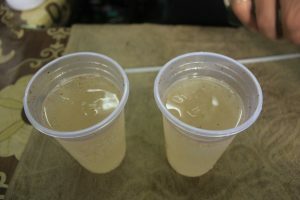 Banta, as it is known to locals in Delhi, is lemon soda to which a pinch of black salt has been added for that tangy twist. It is much sought-after as a great refresher in the torrid climes of Delhi. A reasonably tall glass of cold banta comes for Rs. 15/-. Since the shop (like all other shops in Chandni Chowk) is actually a crevice on the old wall, there is no shade to stand under. Gulping down the cold drink standing in the glare of the hot sun is an interesting experience. And now, for some famous dahi bhalla. 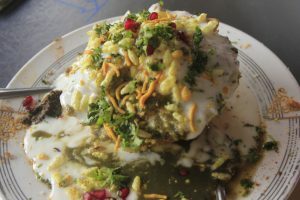 Located at the mouth of a lane that leads to Chandi Chowk metro station, Natraj has been dishing out dahi bhallas since 1940. A bhalla is a fried, sour ball of gram flour. After it is cut into small pieces, onto which fresh, thick curd is poured. This is then topped up with generous doses of green chutney (made from crushed mint leaves) and khatti-meethi chutney (sweet-sour chutney made from tamarind) and served to you. I shovel a piece of the bhalla into my mouths and feel a soft explosion of flavours hit my palate. By now, it is well past noon and the sun is high up. Thanks to our prolonged culinary assault since morning, our stomachs are bulging and our knees buckling. We are tottering on the pavement. Much as we’d love to have a second helping of the bhalley, we are forced to keep that for another day. For now, we just want to head home and crash. But before that, one last stop. Several decades ago, Dariba Kalan was famous throughout Delhi for its goldsmiths and jewellery shops. Though many of them remain in business, many others have shut shop. At the entrance to this narrow lane is a shop whose business has nothing to do with gold or jewels. 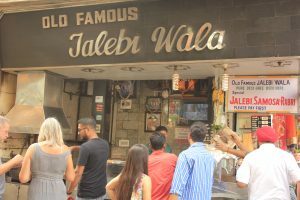 Welcome to Old Famous Jalebi (heck, I am not using these words as adjectives, but as a proper noun. This is the name of the shop, you see?) When your outlet is old and famous, why complicate matters by naming it anything other than ‘Old Famous?’ The shop has been around since 1884. 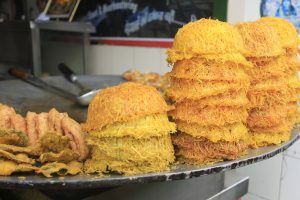 Thick juicy, golden-coloured rings of fried batter lie in trays, waiting to be bitten into. A pot-bellied cook is taking out fried maida rings from the cauldron and dunking them into a large vessel containing sugar syrup (known as ‘chashni’ in Hindi). A crowd of about fifteen is jostling for space where there isn’t any. Here, you have to pay first and then take your goodies. 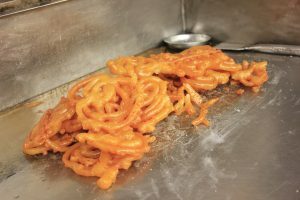 Not being in any shape to eat them there, we ask them to pack a kilo of jalebis for us. We will enjoy them in the comfort of home, sprawled on comfortable beds. And then promptly go on the blink. Old Delhi is a city within a city, a world in itself. In its warren of narrow streets are several food joints like the ones I have described above. One trip is not enough to do full justice this area. 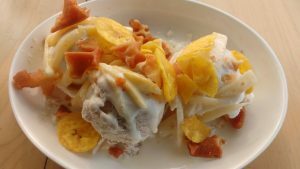 You could therefore make a beginning by visiting the above-mentioned eateries and then come back another day to continue your culinary sojourn. 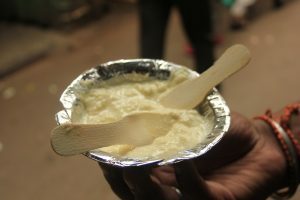 After my next visit to Delhi, I will upload Part 2 of the Old Delhi Food Trail. By and large, most eateries here are open from 8 am to past dusk. You can therefore visit any time in between. The trail I have described here took us about four hours to complete at a leisurely pace. Just keep the heat of the city in mind when you plan this trip. The temperature stays above 40 degrees Celsius for most of the year and the humidity is high. The best way to go to Chandni Chowk is by the metro. Taking along a private vehicle would be a bad idea, because you won’t get a place to park. 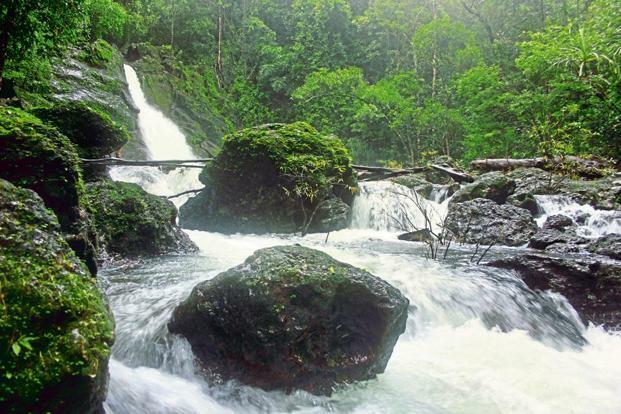 This area is congested with a capital C.
With coffee estates, lovely treks, waterfalls and encounters of the wild kind, Sakleshpur can surprise you. Do yourself a favour and go there right away. It was a spur-of-the-moment decision. One moment, we were chatting about heading back into the hills and the next moment, we had decided to go to Sakleshpur the next day. This is how we decide on most of our trips, because it goes with our personality (of not thinking and planning too much and leveraging the spontaneity of the moment). 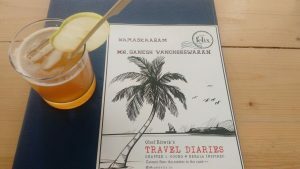 We had visited Fort Kochi as a family just three weeks ago (and I had packed in a solo trip to Madras/Chennai after that), but already, there was this strong itch to go away somewhere again. So we set out Saturday morning by car. We have heard that the train route from Bangalore to Sakleshpur is also scenic, but we kept that for another time. Leaving home at 5 am (to avoid the traffic nightmare that invariably descends on this city as early as 6 am), we were in Nelamangala by 5:45. A brief stop for a cup of tea and we were on the move again. Reaching Chennarayapatna at about 8:30, we breakfasted at Adyar Ananda Bhavan (AAB). We’d have preferred a smaller outlet that was more ‘local’ in nature, but there was nothing like that for a long distance. And so, AAB it was. When we set out again after this pit stop, it was 9 am. We breezed through Hassan, after which the road became a little narrower and rougher (but it was still reasonably good). We reached our guest house at exactly 10:30 am, 5 hours after we left home. It was a comfortable ride overall, and if you consider the two halts, I’d say we made good time. Our guest house was nothing fancy; but, it was clean and comfortable, with excellent views of paddy fields on one side and a jungle on the other. I wondered about its fancy name (Butterstone River Valley), but forgot to ask the manager about it. We checked in and lazed around for a while, stretching our cramped muscles and just settling down. An hour or so later, we walked over to a waterfall nearby. The leisurely ten-minute stroll took us past humble houses built in the Malnad style, piles of logs kept on the roadside (and to be used to make a fire later on, I guessed), coffee plantations and rough-hewn paths that led into the forest. It was good to be walking in the hills again– my mountain-loving soul was on song! The small sign board said ‘Abbi Falls’, although the manager of our resort had called it ‘Habbi Falls’. Nothing much in the spelling, really. It is quite common to find different spellings of the same name in India, with one syllable more or less. One of the funny things about this country is that, with its varying languages and dialects, it is enough to be able to pronounce a name somewhat correctly – an approximation of sorts. A short, but slippery descent through a mud path took us to the waterfall. We heard the sound of the water just before we turned the final bend and emerged from a clump of bushes. At first glance, it was nothing much; the water plunged about 25 feet after which it eddied for a bit amidst the rocks before forming a stream. But as we started moving towards the fall, we realized that the rocks and pebbles were slippery. Some tricky negotiation of this stretch and some Dutch courage took us to the point where the water was plunging down. It was then that I realized that the water was falling with considerable force, even though the height wasn’t much. We slipped into the water (cold and so refreshing) and stayed there awhile. Much kicking, splashing and squealing happened. After a time, I ventured past the water eddies and sat directly under the water’s flow. Fat drops of water now hit fell on my head and back directly, making me feel the force of the current anew. I emerged from the water curtain after about twenty minutes, feeling thoroughly refreshed and my skin tingling. We then sat on the rocks for a long time, letting our clothes dry in the warm sun. The warmth of the sun was in contrast to the cool breeze – it was a feeling to be savoured. So far, we had had the place practically to ourselves, but now a small crowd arrived. We sat there, idly watching them, letting the breeze caress our bodies, listening to the sound of the insects in the forest, wondering at the continuous rush of the water….time just passed. Finally, reluctantly, we dragged ourselves from that spot and trudged back to our resort for a hearty (and well earned) meal. Predictably, we felt heavy-lidded after lunch and crashed in our room for a couple of hours. Awaking in the late afternoon, we found some piping hot filter coffee waiting for us. I had forgotten all about coffee!Sakleshpur is coffee country, home to thousands of acres of coffee plantations. So no wonder we were being offered some fine coffee by the resort. A leisurely cuppa later, Shankar who works at the resort, offered to take us on a plantation walk. The plantation was about 80 acres in size (small, as plantations go), but it was in the midst of a thick jungle. Our path was rocky at places and highly uneven, which meant that we really had to focus on it. At particularly steep stretches, I could feel my sinews stretching. I remember thinking that this was proving to be more of a trek and less of a plantation walk. Coffee had been planted in between a variety of native tree species, forming a thick jungle. As we hiked, Shankar pointed out coffee bushes and explained how coffee is grown. Apparently, it takes about a year for the coffee beans to sprout. Of the different kinds of coffee, Robusta and Arabica are the predominant varieties in Sakleshpur. They differ in taste and aroma. Sprinklers meant to water the bushes punctuated our trail. We kept up a steady pace, trying to concentrate on both the tough trail and Shankar’s monologue. After about forty minutes of hiking, we stopped for a short breather. Silence enveloped us, broken only by our slightly ragged breathing. We took a few pictures of the scene. Charu (the wife), said ‘Oh, look. There is a bison.’ And when I turned to look, there indeed was a bison. About seven feet tall, he seemed to be gazing at us calmly. And we gazed back at him calmly. He was standing on the edge of the path, half inside the bushes, about twenty feet from us. But it was when Shankar saw the animal too that all hell broke loose. He just whispered ‘Run!’ at us, turned and matched action to word. Nonplussed by this unexpected turn of events, we stood rooted to the spot for a moment before Shankar’s feverish ‘Run (exclamation) reached our ears a second time. The blood gushed through our veins and we started running. Honestly, I should call it scrambling. We ran blindly for God knows how long. We ran back the way we had come, our minds a total blank – except for the fact that, by now, we had realized that the bison could be a very dangerous customer indeed, inspite of his benign expression. I don’t know how far we ran, huffing and puffing. I had the extra task of holding on tightly to my DSLR, a task that suddenly seemed onerous. My legs felt like chunks of lead and my lungs were on fire. As we ran, I was haunted by the thought that any moment now, the bison could gore us into the ground from behind. And finally, when we felt we couldn’t run an inch more, we stopped. The silence and calm around us was in shocking contrast to the turmoil in our heads. As our breathing returned to normal, we started walking slowly. Shankar assured us that we were out of danger now. Reaching our guest house, the first thing I did was to imbibe some stuff far stronger than coffee. God knows I needed it. As I sat on our porch afterwards, I thought back to the experience. Somehow, it felt unreal. But the fear and exhilaration coursing through my mind were telling me that it had been all too real. We sat on the porch for the rest of the evening, reading, chatting and enjoying views of the now-golden paddy fields. Dinner was a subdued affair, because we were happily tired. We set out early the next morning, after some more of that wonderful filter coffee. We drove about 10 kms from the resort, parked the car and then trekked up to a peak that was perhaps a kilometer away. This and two other peaks that were close by, we together called Byreshwar Gudda (‘gudda’ means peak in Kannada). The name is actually that of the deity of a small temple close to where we had parked our car. Byreshwar is a common deity in Karnataka, and an incarnation of Lord Shiva. The peak was open on three sides, offering us a stunning, 300 degree view of the valley and the ranges yonder. Behind us, a steep path rose up to another cliff.We were there for a long time, taking pictures, enjoying the view and lying down on the moist grass. A wind was gusting and the sun was slowly warming up to the day ahead. Shankar pointed out an elephant corridor in the distance. Places like this shoo away all thoughts from your mind and compel you to live in just that moment. Looking up, I badly wanted to gather the deep blue sky in my arms. We spent an hour on the peak, before carefully picking our way down. As we were walking, a small stone temple hove into view. This was the temple that has given the peak its name – Byreshwara Devasthana. Local legend says that the Pandavas built it and dedicated it to Lord Shiva as part of their prayers to the yogi God. Such legends abound in a country like India. There is no way one can verify them. And so, the best one can do is to take the legend at face value. And before you know it, the place automatically acquires a sense of history and atmosphere. Inspite of the plain stonework, the temple looked elegant. The still-soft sunrays formed a halo around the temple crest. The design of the crest looked unique to me – fashioned into a nine-step arrangement, it was like nothing I had seen in any other temple. We drove back to our resort in silence, our minds stilled by the lovely experiences of the morning. Breakfast was a simple but tasty affair, comprising spicy sevai (rice vermicelli), akki roti and coconut-garlic chutney. We chased down the meal with tumblerfulls of – what else? – filter coffee. We then had a quick bath and checked out of the resort. In leaving, I managed to buy some coffee powder from the manager of the resort. The powder had been sourced from their own estate, the one we had walked in the previous evening. Driving back to Mangalore Road, we stopped at Manzarabad Fort – our last halt of the trip. 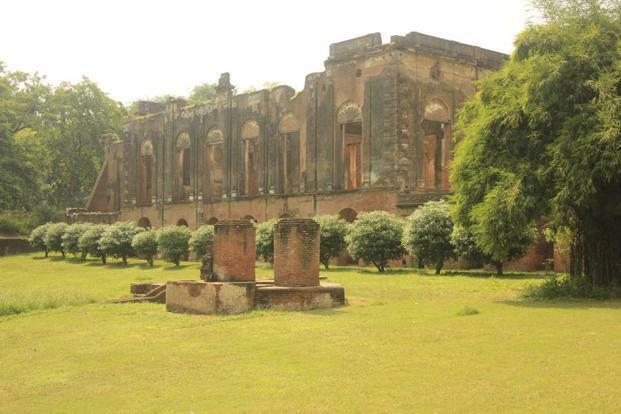 It seems that outside the Sakleshpur region, hardly anybody knows about this fort. And yet, it is a thing of beauty, tucked away amidst forests and coffee estates. We had to park the car on the main road and go the rest of the way on foot. Steps with a railing have been laid to make the climb slightly easier for people. We counted 255 steps from bottom to top in what was a short, but steep climb. As forts go, this one is small. Its visual attraction is that it is built in the shape of a star, though I realized that you’d have to view it from a helicopter to make out that shape. This fort was extremely important to Tipu Sultan, because it helped him guard the ghat ranges in this part of Mysore Province, of which he was the ruler. At that time, he had to fight continual battles with the British, the Marathas and the Nizam of Hyderabad. Like other old forts in many parts of India, this one too is in reasonably good shape (it was built in 1792). We walked past the old garrison, peeped into dark chambers and admired the step-well built right in the middle. Bending and walking through a narrow passage, we emerged inside a watch tower. This must have been where soldiers would have stood centuries ago, guns at the ready, not knowing when the enemy would attack them. The broken ramparts of the fort gave us a sweeping view of the surrounding hills. Our drive back to Bangalore was smooth. We made it home in exactly five hours (including a halt for lunch at Kamat Restaurant near Channarayapatna). As we sat sipping ginger tea at home, we thought back to the lovely place we had left behind and started making plans to return there. The Sakleshpur region is about 4000-4500 feet above sea level. 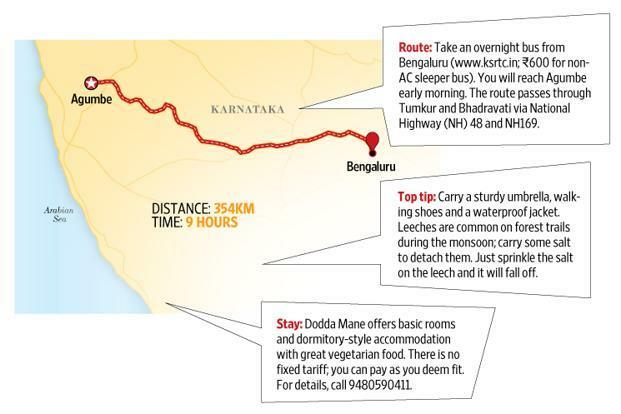 Situated on the Bangalore-Mangalore route, it takes a running time of 4 hours by train or car. Apart from coffee, pepper and cardamom are also grown here. The salubrious climate makes it good for growing spices. Sakleshpur forms part of Malnad, a socio-cultural name given to this part of Karnataka. The word ‘Malnad’ comes from ‘maley naadu, which means ‘hill country’ in Kannada. Houses in this region are characterized by sloping roofs clad in elegant brown tiles and a colonnaded porch for people to relax in. By and large, this area is unknown to people living outside Karnataka. 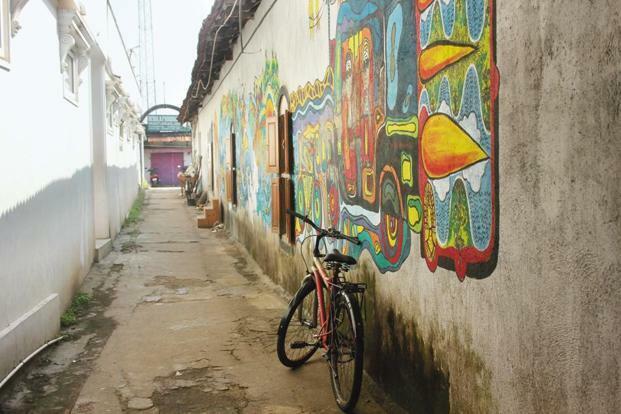 As of now, most tourists to Sakleshpur come from Bangalore. 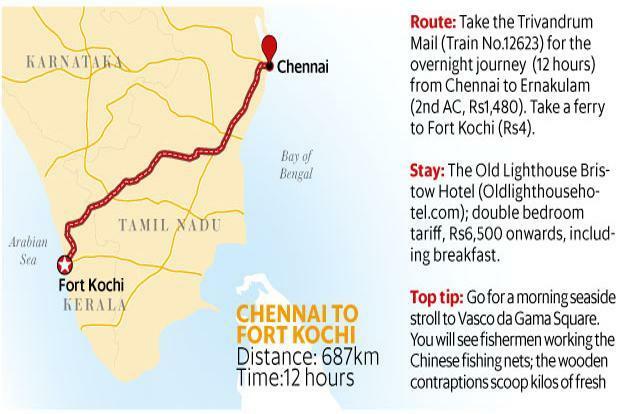 Other than tiny, dubious-looking eateries, there aren’t many good options on this route. 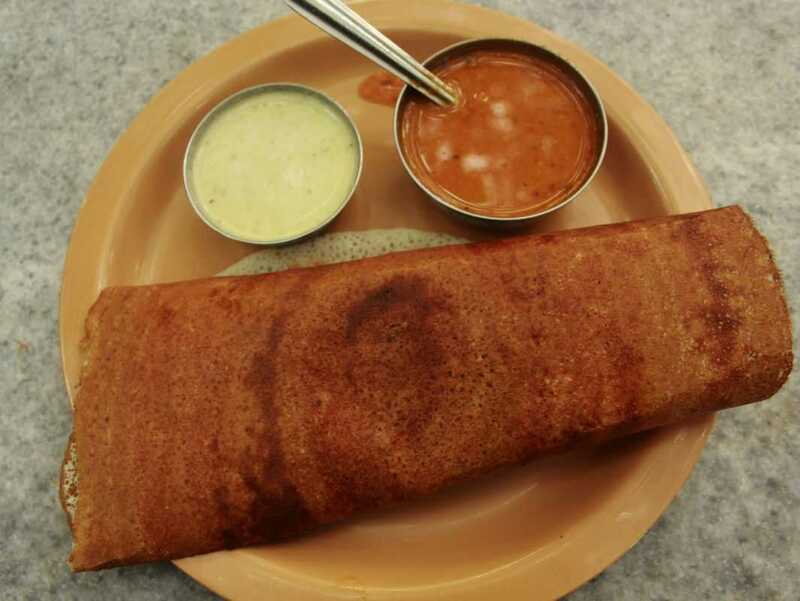 It is therefore best to stop at Adyar Ananda Bhavan in Chennarayapatna. Though overpriced, the food is very good. Kamat Restaurant, diagonally opposite Adyar Ananda Bhavan, is really not worth it. We stayed at the Butterstone River Valley, a guest house that is about 24 kms from Sakleshpur town (where incidentally, you can buy essentials and tank up). 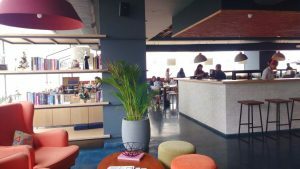 A quick sidenote about this guest house: it is good for those who want a simple, no-frills place which just lets you hang out with friends and indulge in a few team activities. You can play badminton, volleyball and mud volleyball. There is a rustic ‘swimming pool’ too (by that, I mean a tank where you can dunk youself). 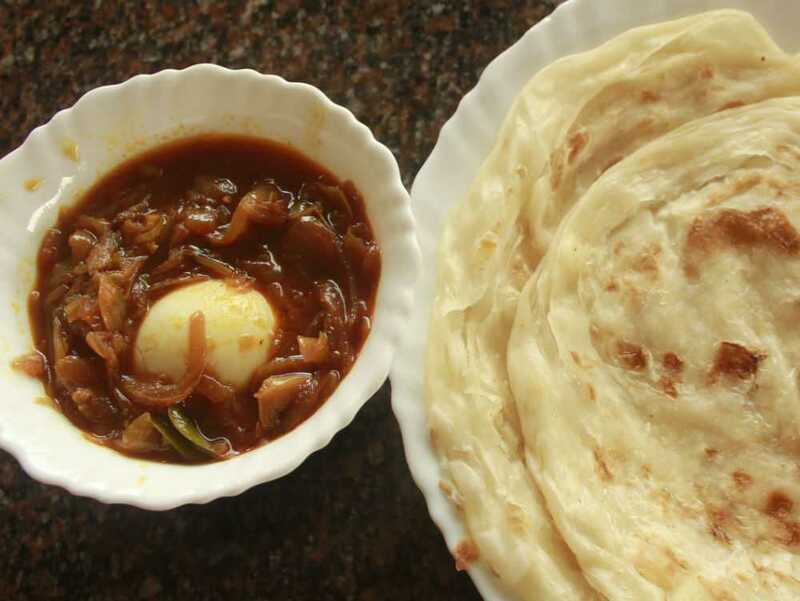 You get authentic Malnad breakfast, but the cooks lose their way at lunch and dinner. If you want superb all-day food, a wide menu, personalized service, a well-appointed room and the trimmings of a real resort, this place won’t cut it. When we went there (April 2017), this region did not have luxury resorts. 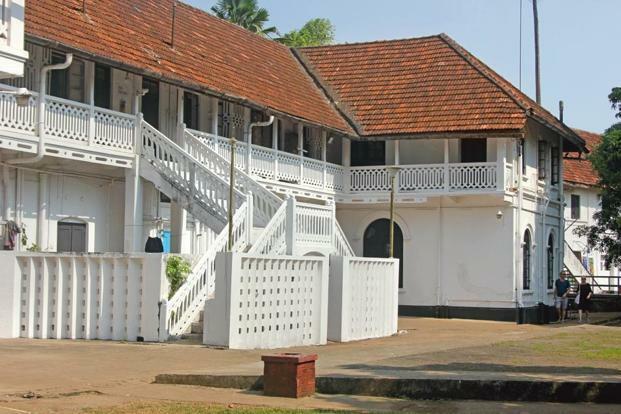 Look for a good homestay that offers you scenic views, local cuisine and superb filter coffee. When you leave, buy some coffee powder. Buying close to source will mean that you will get excellent quality at a good price. Ask the manager of the guest house for help in this regard. Lucknow. Even if you are not part of the regular travelling set, chances are that you would have heard of this city. After all, it is one of the most feted cities on the historical and cultural map of India. There are hundreds of accounts out there that extol the glory of this city. Lucknow was founded by Kanishk Gupta. 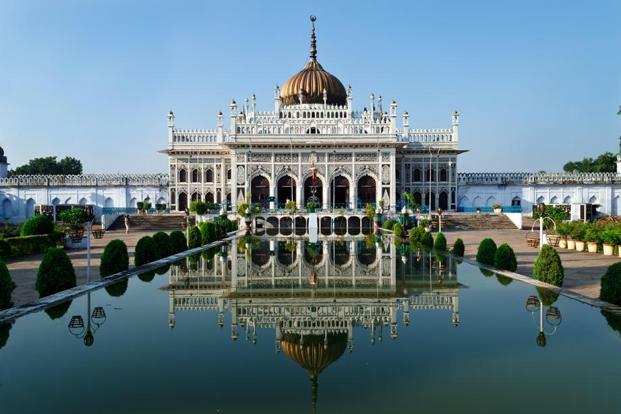 Though it came under the heel of several dynasties over the centuries, it most popularly known as the ‘Nawabon ka shahar’ – the city of Nawabs, erstwhile rulers of the kingdom of Awadh (the Brits pronounced it ‘Oudh’). The Nawabs lorded over Awadh during the 18th and 19th centuries. Most of the heritage structures (palaces, tombs, mosques, mansions, clock tower, city gates and mourning houses) you see in the city today date back to that period. The Nawabs were hedonists. It is well known that they had a large appetite for wine, women and song. 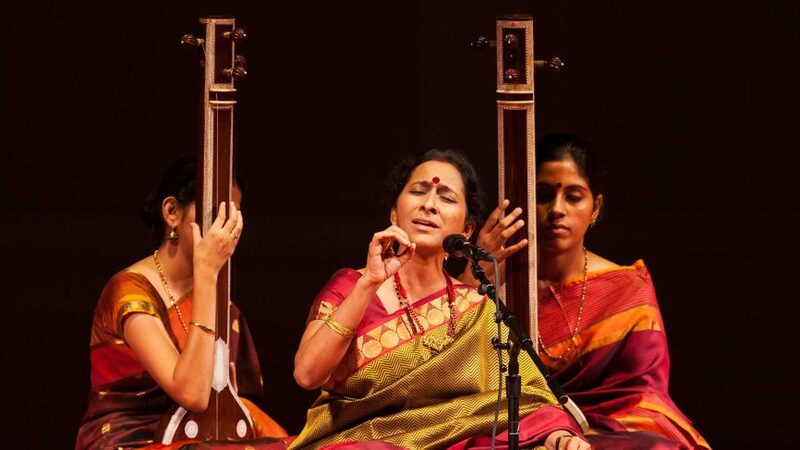 I like to call this ‘sharab, shabab and rabab’ in Hindustani, the local language of Lucknow. To this, I’d add another word ‘kabab’ (a mutton-based delicacy, but also a larger metaphor for food itself) to complete the description. It would be spot on to say that ‘sharab, shabab, rabab and kabab’ captures the long-held worldview of many of the city’s denizens. Most articles on the food in Lucknow make it out to be a city for the carnivores. Ask someone what food this Nawabi city is famous for and pat comes the reply ‘Kababs and biryani.’ A few others will perhaps add ‘sheermal and korma’. Except sheermal, all these are meat preparations. 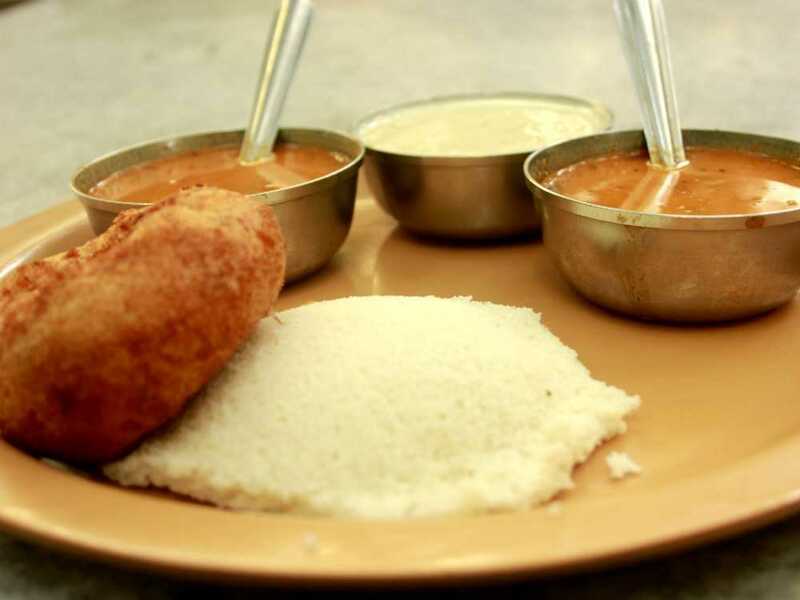 What is not mentioned with equal fervor though, is the lesser-known fact that the city is a haven for vegetarians also. 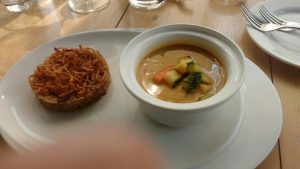 Over a few visits to the city in the last decade, I have sampled the best vegetarian fare that this city has to offer. Which is why I thought a guide like this will help others who visit the city. When you are in Lucknow next, don’t forget to dig into these. Please note that you do get other vegetarian dishes too in Lucknow – including regular North Indian staples. 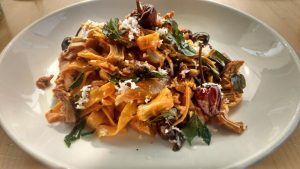 The list here only mentions my favourites from among the signature dishes of this wonderful city. Also, the list of eateries I have recommended is by no means exhaustive. 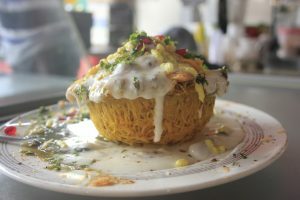 Tokri Chaat: Tokri means ‘basket’ in Hindi. So, this is literally chaat that is placed inside a basket. But, wait. It’s not what you think – not a wicker basket. 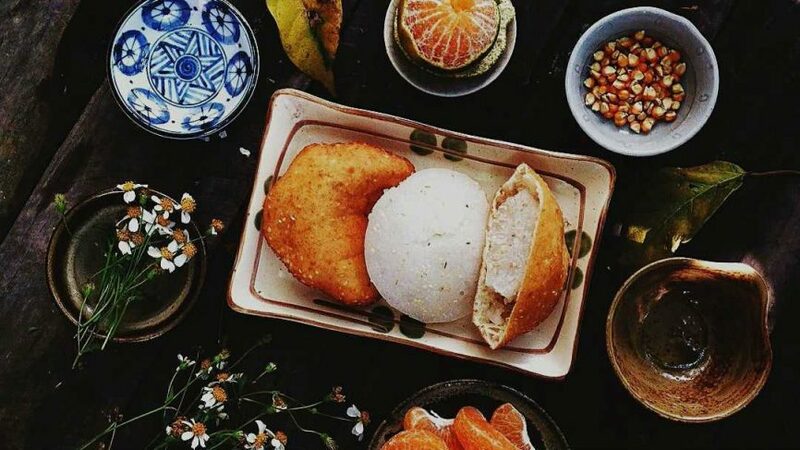 It is an edible basket that is stuffed with chaat. So, you gorge on the chaat and finally, gobble up the basket too. 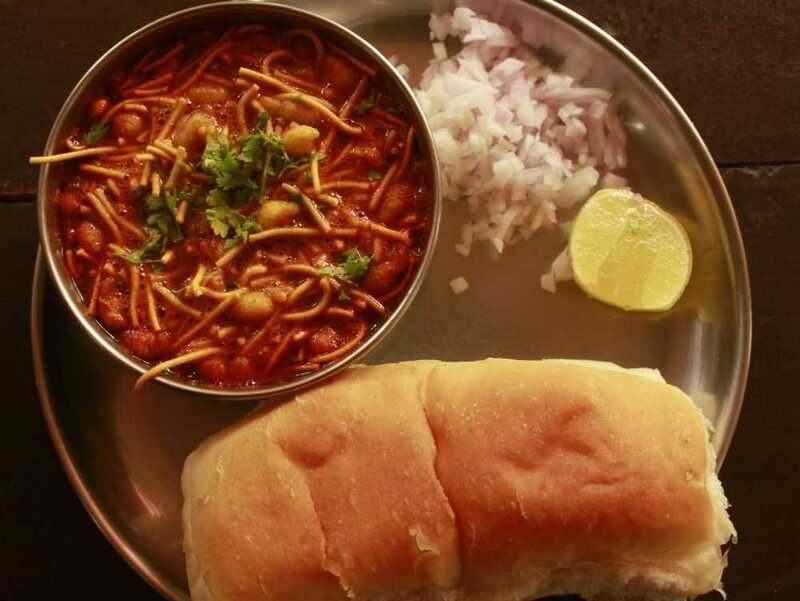 This dish is more of a packaging innovation, to put it in Marketing parlance, because the ingredients are those you’d find in a regular chaat all over North India – diced potatoes, imli (tamarind) chutney, dhaniya/pudina ki chutney (chutney made of coriander or mint leaves), dahi (curd), etc. Still, there is some novelty here and it does taste good. What’s more, it is quite filling, too. Where? Royal Café, Hazratganj; Madhur Milan near Hanuman Mandir in Aminabad. The messier, the better. Curd and pudina chutney overflowing the edible ‘tokri’. Tokris awaiting their turn. They are kept on a large griddle to keep them warm until their time comes. 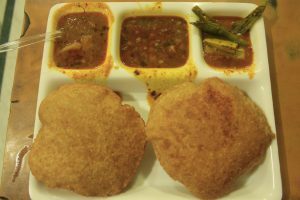 Tikki (flattened patties) is a common enough dish all over North India. But in most places, they are made out of aloo (mashed potato). 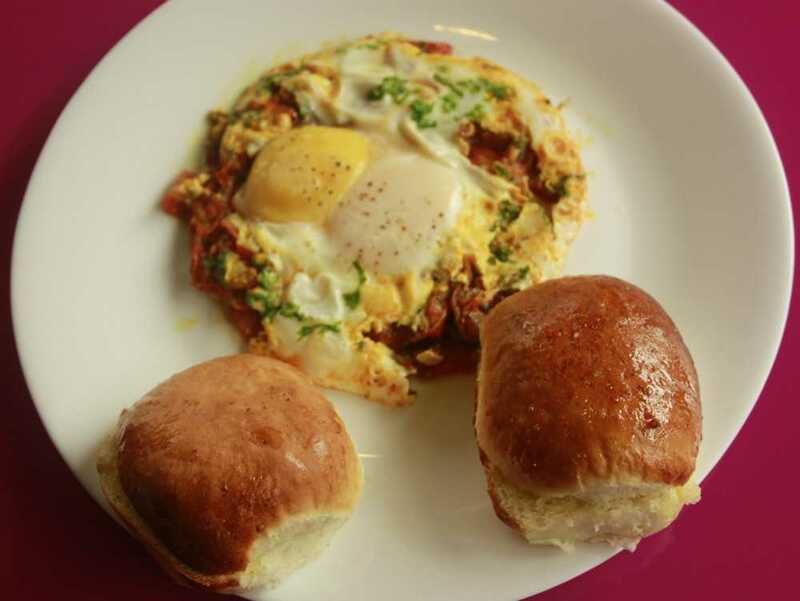 Lucknow though, offers up an interesting variant of this streetside dish – the mattar tikki. This is a spicy patty made from a mixture of mashed green peas, potatoes, green chillies and spices. 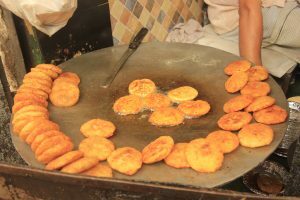 The patty is shallow fried in a pool of oil on a large tawa (griddle) until the edge and both sides turn crisp and golden-brown. The inside however, remains soft. The crisp and soft contrast works wonders on your tastebuds. Best eaten with pudina (mint) or dhaniya (coriander) chutney and a sweet-and-sour chutney made from jaggery and tamarind. Where? Shukla Chaat House, Hazratganj; Ram Narayan Tiwari & Sons, Aminabad. Mattar ki tikkis on the griddle at Shukla Chaat House. Sharing space with tokris, aloo tikkis and other snacks. 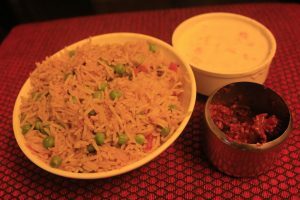 Tahiri – this is a wondrously flavourful rice dish made with seasonal vegetables and masalas. For want of a better description, you can think of it as a vegetarian counter to the biryani. Try peeping into the history of this dish and you might lose your bearings in no time. Legends abound. One of them goes that the Nawabs of Awadh wanted a meatless equivalent of the biryani (Nawabs and meatless? Go figure. ), which is why they had their cooks create Tahiri. Another tale says that it actually originated from Hyderabad (though these days, one can find hardly any trace of this dish in the city of the Charminar ). According to yet another, Tahiri is a descendent of the pulao. In any case, one whiff of fragrance from this dish will dismiss all thoughts about its genesis and history and make you drool. The Tahiri I have had in Lucknow came with perfectly cooked long-grained Basmati, with a mix of cauliflower, sliced carrots, green peas and chunks of potato, all of which were first shallow-fried in butter. The secret to its flavor and taste though is the fine blend of hand-ground spices made afresh every day. Cardamom, turmeric, ginger, bay leaf, black pepper corns, cumin seeds, garlic and ginger come together to unleash magic on your palate. No wonder then, that on each trip to this city, I must the Tahiri at least once. Where? Heritage Hotel, Charbagh. 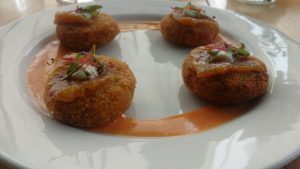 There definitely will be other outlets in town serving this dish, even though I have tasted it only at Hotel Heritage. Ask the locals and they will guide you. Tahiri, served with thick onion raita and mango pickle. Just before I waded into it. 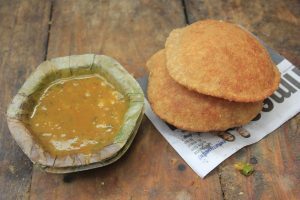 Poori-aloo Without question, this is one of the most popular breakfast dishes in the eateries of Lucknow. Why, some of the joints start serving it from as early as six am and keep it up till about eleven. Some others serve it through the day. A paste of green chillies, ginger, asafoetida, cumin seeds and curd is mixed with wheat flour to prepare the dough for these pooris. The dough is rolled into small balls, which are flattened and fried in a deep pan. And out come crisp, mildly spicy, mildly tangy pooris. These are eaten with a gravy-based potato curry, a spicy chickpea curry and sometimes, pickle too. Pooris are slightly high on oil, but don’t let that stop you. After all, you will not find this particular taste in many other places. Where? Ratti Lal’s in Lalbagh. Pooris, aloo ki subzi, chholey and mixed vegetable pickle. In most parts of North India, this is the dessert to end all desserts, though it is officially not classified as ‘dessert’. It is made by wrapping a few leaves of the betel vine around areca nuts and slaked lime. You can ask the paanwaala to add tobacco to this mixture for an added bite. You’ll find locals idling in the shade, chewing paan after a hearty meal. One theory goes that the juice of the areca nuts that are wrapped inside the paan leaves has digestive properties. Though this claim is contested by some people, what is not contested by anybody is the fact that paan gives you a mild high. If you have a sweet tooth, the meetha paan (sweet paan) may be just the thing for you. Where? Tiny paan shops all over the city. Just look around from anywhere and chances are, you will spot one. 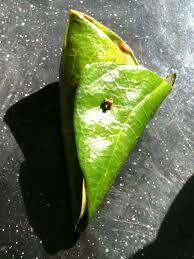 The famed paan. Pop it into your mouth and get ready for a pungent taste and a burst of flavours. ‘Thandai’ translates to ‘coolness’ in Hindi. And the drink delivers on that promise, straight and simple. It is an off-white, frothy concoction made from an intriguing mixture of ingredients: almonds, fennel seeds, watermelon kernel, rose petals, pepper, white poppy seeds, cardamom, saffron, milk and sugar. 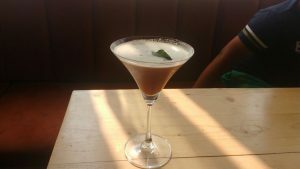 There is no fixed recipe for this drink, each joint feeling free to add its own twist to the concoction. Which makes it all the more intriguing. Where? Raja ki Thandai, a small shop in the Chowk market. It has been around for several decades. It comes in two sizes: regular (chota) and large (bada). Psst – for a dose of intoxication, ask him for the bhaang thandai, infused with cannabis. Sweet, frothy thandai waiting to be downed.